I’ve been in law enforcement for nearly three decades, and early on I realized that “good enough” is never “good enough”. Whether it’s the vehicle you drive, the reports you write, or the equipment you use, striving for the best almost always brings about the optimal outcome. For me, that philosophy carries through to everything I do and everything I use. Like many of the lessons we’re taught in this line of work, I learned about the importance of the watch in police work the hard way, with failure. During one typical night of patrol work, if there is such a thing, I was the first on scene of an armed robbery. When I arrived, the suspect saw me, dropped his weapon, and ran across a muddy field. After catching him, and the brief struggle that ensued, I checked my watch for the time of arrest. The only problem, there was no watch where it should have been. My backup eventually found it, but it didn’t matter, it no longer worked anyway. Not only had the band separated from the case, but the internal workings had also succumbed to the rigors it had faced. For someone who appreciates a nice watch in his off-duty time, this was unacceptable performance for a piece of equipment so vital to me. I needed something that wouldn’t fail me when I needed it the most, that’s when I discovered the G-SHOCK. My original G-SHOCK was a resilient watch with the basics I needed: time, an alarm, a stopwatch, and a well-lit face. In the many years since G-SHOCK has taken the art of the rugged watch to new levels of sophistication. During those same years, my police role also changed. I moved into a detective position where, in addition to reliability, appearance is important. G-SHOCK had me covered. I later made the transition to a pilot in the air support unit. 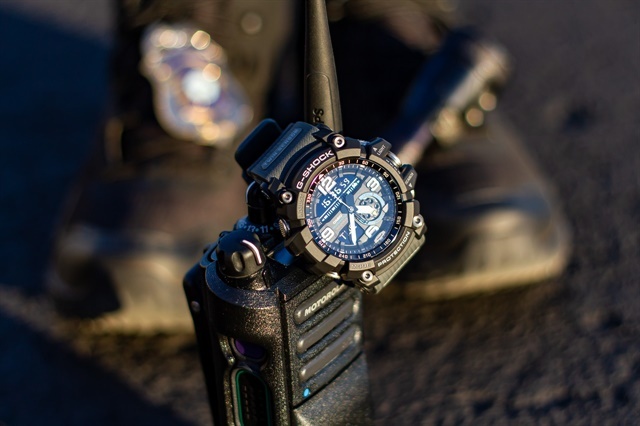 Whether chasing down a suspect, interviewing leads in an investigation or landing a helicopter on the side of a mountain, an accurate and reliable timepiece is of utmost importance. 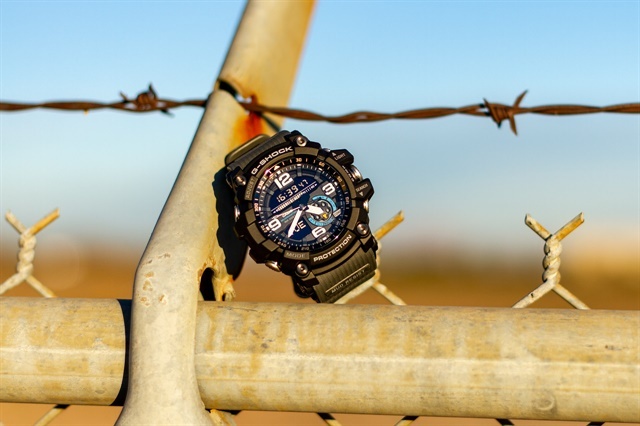 The MUDMASTER series is known for its toughness and the GG1000-1A8 definitely upkeeps this reputation. The Mudmaster GG1000-1A8 is the newest offering in the line and it incorporates an impressive set of features into a hardy, great-looking timepiece. At first glance, you know this watch is serious. From the band made of a resin rubber with metal double clasp to the beefy case, it’s all about toughness. Instead of thin, spring-style pins, the band is attached with hex bolts and it wraps to the underside to provide additional protection for the back. While it looks hefty, it’s actually light on the wrist at only 3.3 oz (94 g). The sizable case is ringed with five checkered-surface metal buttons to access the multiple functions. These oversized buttons are the hallmark of the MUDMASTER moniker. Utilizing a pipe and piston mechanism, each shaft contains rubber gaskets to keep out mud and dust and maintain the 200M water and shock resistance. Their size also makes them easily accessible, for large or gloved hands alike. The crystal face is inset to protect against bumps and scratches, surrounded by a compass bezel with 10° markings. Under the glass is where the action is found. Primary timekeeping is shown with large numerals at 12, 3, 6, and 9, and Neo-brite Luminous hands pointing them out. In addition, there is a mode indication dial and two information screens. It’s these screens, in combination with the hands, that the multitude of features is accessed. While many of these complications would have been useful during my patrol days, of particular use in tough situations are the compass and thermometer, both of which are quickly accessed at the push of a single button. Whether calculating temperature-based engine performance parameters or confirming directional headings, the convenience of these as an accurate backup to flight instruments is extremely valuable. When you’re knee-deep in the action the easy-access menu system of the GG1000-1A8 will make those necessary, usable features all the more valuable. Over the past three decades, I’ve tried out many watches through my various police assignments. I’ve paired them with patrol uniforms, detective’s coat and tie, and flight suits. I’ve put them through the paces on the streets, in the courts, and through the skies while performing my duties. Some were good, some were not. 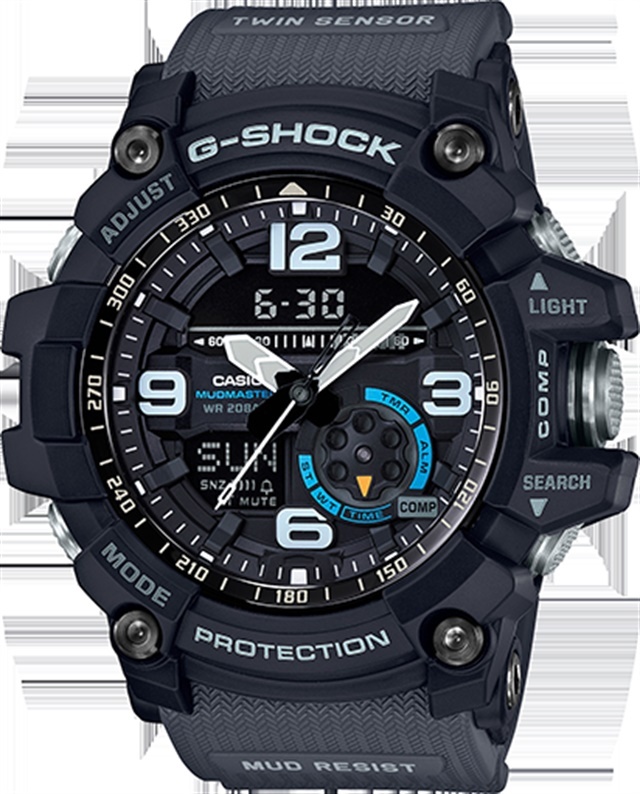 After all this time and all these real-world tests, I’m yet to find a watch with a better combination of accessible, usable technology wrapped in an impressive looking, rugged exterior, than the newest offering from G-SHOCK. The MASTER of G MUDMASTER GG1000-1A8 will undoubtedly carry on the tradition of the watches that earned it the MUDMASTER name and reputation. None can compare with the durability of the MUDMASTER.